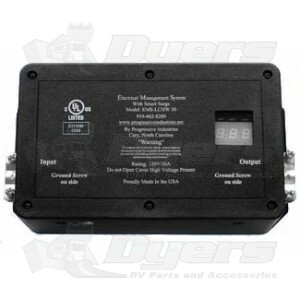 Progressive Industries 30 Amp Permanent Electrical Management System has an easy to read screen hardwired into your RV constantly protecting you from power surges, reverse polarity, open neutral, open ground, AC frequency deviations with accidental 220V Protection. Surge protection is a necessity when you own an RV, traveling around the country leaves your RV wiring system open to power surges, lightning strikes, and all sorts of electrical issues. Sure you can plug in a portable surge protector, but what if you forget it, or it could be stolen. Hardwiring a surge protector into your RV also keeps it indoors and out of the weather protecting your EMS from the elements. Progressive Industries 30 Amp Permanent Electrical Management System is built into the wiring of your RV, if something happens and you need to control the unit, there is a built in bypass switch that lets you turn power back on. Even if you bypass the system the surge protection part of the EMS stays active. Having a permanent EMS system also allows you to maintain the unit. The modular design of the Progressive Industries 30 Amp Permanent Electrical Management System means easy to install replacement parts. The Progressive Industries 30 Amp Permanent Electrical Management System has 3-Mode Surge Protection giving you full surge protection L-N, L-G, and N-G, with a joule rating of 1,790, and a 44,000A surge current. The 30 Amp EMS system is constantly monitoring. The Progressive Industries 30 Amp Permanent Electrical Management System is a computer with a state-of-the-art microprocessor that is programmed with software that will immediately turn off power if there is reverse polarity, open neutral, open ground, AC frequency deviations +/- 9 hertz from 60 cycles per second, or accidental 220V. The Progressive 30 Amp Permanent EMS reacts at <1 nano second, that is one billionth of a second! The Progressive Industries 30 Amp Permanent Electrical Management System is looking out for you by watching for high or low voltage spikes. If the power falls below 104 volts or rises above 132 volts, power is instantly shut down to your RV. Programmed to create a 2 minute 16 second delay, the Progressive Industries 30 Amp Permanent Electrical Management System will wait to turn power back on in order to protect your A/C compressor. Without this built-in delay your AC will not have time to wind up or wind down, this could damage the A/C motor. The reset indicator light flashes for 2 minutes 16 seconds then power is turned back on after giving your air conditioner time to wind down. A built in easy to read display shows you error codes, and previous error messages. The errors are constantly showing you messages that are displayed for two seconds at a time. The Progressive 30 Amp Permanent System monitor shows you AC power information, voltage, frequency, error codes, previous errors and current. One of the big differences that sets Progressive apart from competitors is a lifetime warranty. Progressive warranties their 30 Amp Permanent Management System for the lifetime of the unit. You can rely on Progressive Industries to stand behind their product. When you’re not out having fun in your RV you are probably storing it, and plugging it in regularly to keep the batteries charged up. Lighting can still strike, and power malfunction can still occur. Having the Progressive Industries 30 Amp Permanent Electrical Management System hardwired into your RV will protect your appliances and wiring if there is an electrical issue. The protection offered in the Progressive 30 Amp permanent surge protector could save you from costly repairs to your RV. At Dyers we like to give our customers all the information about a product that we can. The Progressive Industries 30 Amp Permanent Management System owner manual is available on this page, under useful downloads. You can view the manual and see the wiring instructions, troubleshooting and features. Protect yourself and your RV and purchase the 30 Amp Permanent Electrical Management System from Progressive Industries. I researched this type of product for months and found that the Progressive Industries products are the ones with the best customer reviews by far. I debated between the hardwired and the pedestal mounted versions and chose to get the hardwired version for two reasons. 1). I do not have to worry about theft. 2) I can see the status of my power from inside my trailer. I went one step further and reached out to the company to see if they would actually install it for me and they did. That gave me an opportunity to see their facility and it was first rate. The obvious quality controls and attention to detail of this company are easily seen from the management team to those who actually make the units in their Apex, NC facility. I recommend this product without any reservations. I installed the EMS after the power contractor. This setup protects against park power faults and in case your generator fails to output clean power. A self-install is a heart-stopper for the novice, hire someone if you are not confident and careful. It was a simple installation on my 2012 ACE motor home. On my first trip through four parks. it detected one with E0 failure -and low power. Indeed it was true and prevented my system from the effects. That park, a "quality" private park, reassigned me another space and stated someone else used the site the night before without a complaint (poor guy).